Some say that we know a language well only if we're able to use its idioms appropriately. We agree with this statement completely, which is why we put together a list of the ten most commonly used idioms in the English language. Unfortunately, there is no statistical data that we know of, so we'd love to hear your opinion in the comments bellow. Much like the saying "Brake a leg" this one isn't supposed to be understood literally. What it says is that you would be better off staying quiet than expressing your opinion out loud. If you decide to look this up on Google you'll find one million results of images showing flying pigs. 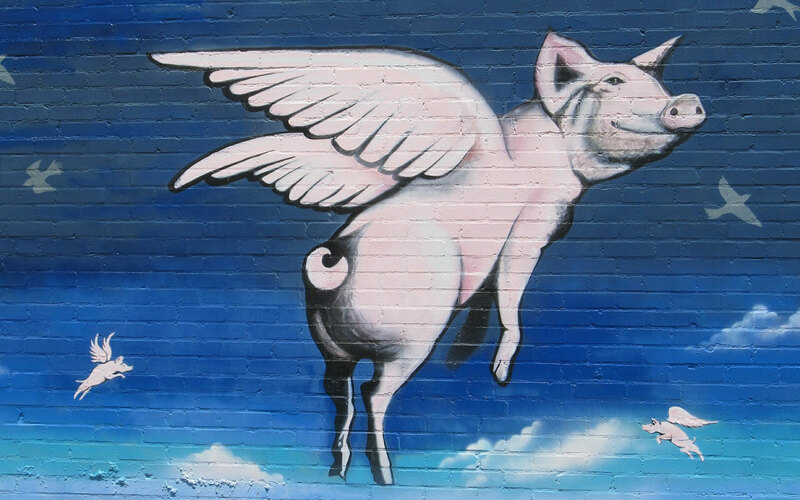 Don't be fooled - pigs don't fly. This is exactly why Brits often use this expression when referring to something which isn't happening. Strange, right? If you've never heard this expression it sounds rather bizarre at first. It describes the relation between two people who begin and maintain their connection flawless and without arguments. Deciding not to move forward on doing something because you're too scared. This philosophy can save you quite some headaches. It tells you to worry about a situation when you are facing it instead of prior to it. Meaning: it's your turn to reply or to act. One of the most popular expressions, describing the worldwide famous rainy British weather. A task as easy as eating a piece of cake. The most widely used expression across the world which has been translated into many languages. It is a metaphor, claiming that you shouldn't prejudge the worth or value of something by its outward appearance alone.